It only happens once per year, and when it does, the northeastern corner of Indiana comes to life in the Standardbred racing industry. 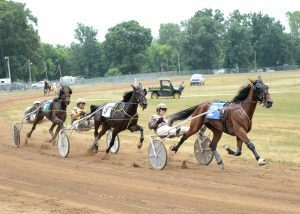 Kendallville hosted its annual late morning of racing, featuring a 16-race program for horsemen and racing fans. 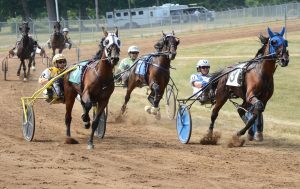 Trainer Larry King connected for six wins on the day followed by Trainer Jack Myers and Driver Alex Udell, who teamed up for five wins with a majority of those coming in the trotting ranks. Myers and Udell kicked off the program with a win in the two-year-old filly trotting ranks with J-S Looney Toon. The Big Stick Lindy freshman crossed under the wire in 2:12.3, two lengths ahead of Starlit Tuffy and Austin Hanners. Evita’s Doll and Mike Peterson finished third. Then, Myers and Udell went to work in the freshman trotting ranks scoring wins in both divisions. J-S Swanman was a 41-length winner in the first division in 2:11.0 followed by a win from J-S Power Chip in the second division in 2:12.0. Udell set the Power Play gelding on the front end and although he had a late challenge by Perfect Gucc and Matt Rheinheimer, J-S Power Chip was able to fend off his opponent for the win by three-quarters of a length. Geen, driven by Jay Cross, was a solid third in the field of six. J-S Power Chip has been a power player for Myers all season. He has three wins in six starts and has only missed the top three once in his career. His best time was recorded at the Indiana State Fair earlier this summer in 2:04.0. Udell, a native of Goshen, Ind., has been aboard for all six starts for J-S Power Chip. After scoring a win in a division of the two-year-old filly pace with a five-length victory with J-S Perfect Cache in 2:08.0, Myers and Udell polished off their day with a win in the first division of the three-year-old trotting colts and geldings with J S Peyton in a time of 2:05.2. The Swan For All gelding, bred by David Yoder and Daryl Lehman, was a seven and one-quarter length winner over Canwetabemnow and Rheinheimer. Starlit Senditback and Hanners finished third. Just as Myers was dominant in the trotting ranks, King was dominant in the pacing ranks, scoring his first win of the day with Misty Shooter, driven by Jay Cross. The two-year-old pacing filly earned a six-length win in the second division of the freshman fillies by six lengths over Faye’s Jet Mile and Mike Peterson with Hypnotic Key and Hanners finishing third. King also had a win in the two-year-old pacing colts and geldings with Shoot to Win, driven by Clint Coy, who made a break after the start and still came back for the win by one and one-half lengths over Gertie’s Gordy and Matt Rheinheimer in 2:09.0. Tinos Pulse and Cross finished third. King’s two-year-old son of Mark Johnathan A Remarkable Life, driven by Peterson, also earned a win in the second division for freshman pacing colts, shooting to the wire in 2:08.1 to win the race by a head over J-S Allnitelong and Udell. Crankitino and Cross finished third. King and Peterson then closed out the card with three straight wins, sweeping the three-year-old pacing ranks with Skyway Shockwave, Gorgeous Sandy and Miss U Big Mike. Skyway Shockwave was a dominant winner in the first division of sophomore pacing fillies with a win in 2:03.2 followed by a win from Gorgeous Sandy in the second division by just a head over My Girl Grayce and Matthew Riggle in 2:06.0. The big matchup of the day was the final race for three-year-old pacing colts between Miss U Big Mike and King Lil Joe, the top two sophomore colts in the point standings for the fairs this season. King Lil Joe, driven by Cross, inherited the lead after a misstep from Noble Fred and Tim Deaton down the backstretch for the first time. Establishing brisk fractions of :28.1, :58.1 and 1:29.4, Miss U Big Mike was ready to pounce and the two fought for the lead in the stretch, with this battle going to Miss U Big Mike by one-half length in a time of 2:01.1. Wanna B Gorgeous was third for Luke Hanners. It was the fourth win on the day for Peterson, who drove four of King’s six winners on the day. Other multiple winners on the day included three wins for driver Jay Cross and two wins for Matt Rheinheimer.